Now I think that 15 years is a pretty good track record. I don't think there are very many consumer electronics that can be used for hours and hours almost every day of the week for 15 years without a hiccup. Yet, I can't help but question the quality of Panasonic televisions. Why? Because we have a couple of Sony television sets that are even older and are holding up strong. Right now, the Sony is sitting in the IKEA wall unit in our bedroom but, like all picture-tube televisions, this set is so heavy that there's an uncomfortable "curve" on the shelf where it rests. It will now be replaced with a brand new (and much lighter) LG 37LC2D--a 37" flat panel LCD TV :0) I was so surprised how easy it was to carry home and setup by myself. I chose this particular model because it's a mid-range LCD that got good ratings in the November 2006 issue of Consumer Reports. Flat-panel TVs are too new to have a long track record, but CR says that LCD and Plasma sets have shown to be just as reliable as picture-tube TVs in the first 2 years. For now, the new flat-panel is in the living room and it will stay there until at least after the SuperBowl next week. I actually heard on the radio that TV sales peak every year in the weeks leading up to Superbowl Sunday. I guess I've just added to that statistic! 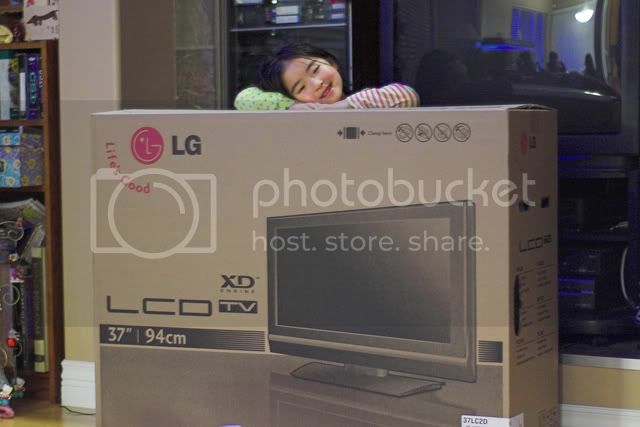 Postscript: I've done some more reading about this particular LG flat screen, and there have been some minor changes in the specifications. The model number printed on the box states: 37LC2D-UE. Changes in this model include two HDMI inputs (vs. one) and one coaxial input (vs. two) and support for higher resolutions when connected to a PC.